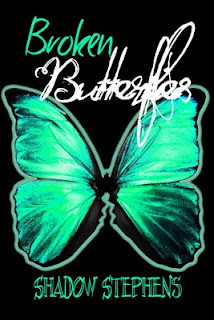 I received Broken Butterflies free from the author, Shadow Stephens, which in no way influenced my opinion of this book. When I read the synopsis I was rather pleased, I thought I had received something a bit different from the norm. I thought the idea that everyone has a guardian angel and that they could turn into butterflies was definitely a new take. for me that was all I liked about this book. All the way through, no matter what happened and how terrible things got, Ilisha wasn't fazed by anything, not the death of her grandma, not the train wreck she was in on the way home for the funeral nor finding out about Angels. When she does find out its like water of a ducks back. Finding out that Bram has lied to her and tricked her into believing he's her soulmate, that she's being stalked by a Death Maker, that she's really married to Damon and she used to be an Angel, I still got nothing from her. She's just so blasé about everything. And the fact that this all took place within a short period of time was also rather far-fetched. When Damon tells her the whole truth about who and what she is, she still doesn't get upset. When he tells her she can become a full Angel again just by drinking his blood, she takes a second to think about it and then does it. It doesn't take long for her to sleep with Bram when she meets him and she thinks she's in love with him until she meets Damon and then realises that she's in love with him instead. She gets angry for a few minutes when she realises what Bram did and when she's told demons are trying to kill her and then she's fine. Again. I really did want to like this book but found that instead of not wanting to put it down, I just wanted it to end. **Just because this reviewer did not like Broken Butterflies by Shadow Stephens does not mean other readers would not love it!